NORMAN, Okla. (AP) — There might be something to Oklahoma’s “Championship November” mantra. The Sooners have won 15 consecutive November games dating to the 2014 season. They already have won two games this November heading into Saturday’s game against Kansas. The late-season success, fueled by coach Lincoln Riley’s high-powered offenses, has helped Oklahoma claim three consecutive Big 12 titles and make two trips to the College Football Playoff. 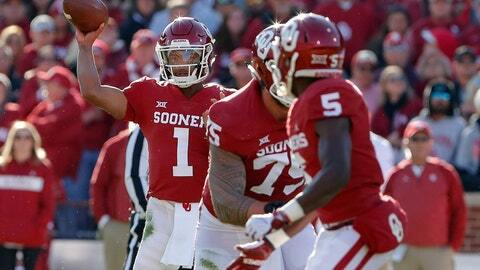 The sixth-ranked Sooners believe they can make another run at both this season. Quarterback Baker Mayfield won the Heisman last season and Murray is a strong contender this season. They have combined to start all but two of the games. Yet, the Sooners are averaging 289.4 yards rushing during the streak while averaging 6.2 yards per carry. Oklahoma has averaged 47 rush attempts to 27 pass attempts, showing a willingness to pound the ball and take pressure off its quarterbacks. Oklahoma has completed nearly 68 percent of its passes during the streak. When you combine a strong, steady running game with efficient, Heisman-caliber quarterbacks, you get something like this: 576.9 yards and 46.9 points per game. Mayfield has set the NCAA single-season passer efficiency record each of the past two seasons, and Murray is having an even more efficient season this year. Oklahoma has set its single-game records for rushing, passing and receiving yardage during this run. Samaje Perine’s 427-yard performance against Kansas in 2014 remains the FBS rushing record for a game. Last season against Oklahoma State, Mayfield passed for a school-record 598 yards and Brown had a school-best 265 yards receiving. When things have gotten shaky, the Sooners have made critical defensive plays. In 2015, when Oklahoma lost most of its lead against TCU, Steven Parker batted away a pass on a 2-point conversion with 51 seconds remaining to help the Sooners hold on for a 30-29 victory. Two weeks ago, Robert Barnes ran back an interception on a 2-point conversion for two critical points in the fourth quarter of a 51-46 win over Texas Tech. Last week, Oklahoma State pulled to within 48-47 with 1:03 remaining, but Tre Brown got his hand on Taylor Cornelius‘ 2-point conversion pass, and the Sooners held on. Oklahoma has forced 27 turnovers while committing just 15 during the streak. The Sooners have lost the turnover battle just three times in those games. Oklahoma has allowed 27.6 points in those contests, which isn’t horrible by Big 12 standards, and certainly more than enough help for Riley’s offenses.